Official Sites in Espanol. And Eye Replacement. I hit the Cubs official site tonight and saw that you can get Cubs.com in Spanish now. A quick tour of the other NLC official sites showed that you can also get Astros.com in Spanish. Totally awesome, in my opinion. I’m very much in favor of making baseball more accessible. 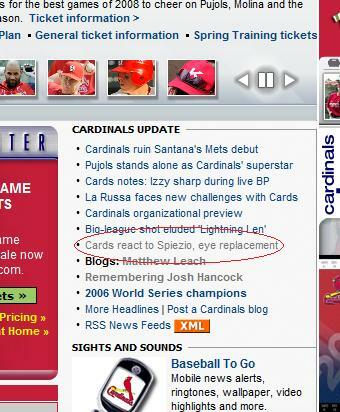 And I’m also in favor of getting Scott Spezio eye replacement–if that’s what he needs–as apparently mentioned in this headline on the Cardinals official site that I saw when looking for more sites in Spanish. I had no idea team doctors were making such impressive strides. Posted in Chicago Cubs, Houston Astros, St. Louis Cardinals. Comments Off on Official Sites in Espanol. And Eye Replacement. Pat, the mighty fine writer of the Pirates’ blog Where Have You Gone, Andy Van Slyke? and contributor to the Fanhouse at AOL brings us a video preview of “The Horrific NL Central.” Man, it’s great. I especially liked the parts about Dusty Baker. Posted in NL Central, Pittsburgh Pirates. While the Reds were busy giving Gary Majewski a very long rope, the other teams in the Central division were busy playing their own fake games. Only there games were even more fake than Cincinnati’s. The Pirates got down and dirty by killing a Manatee. Not only politically incorrect and illegal, but it sounds like a great euphemism, too! But Pittsburgh started off the Spring right by beating up on a local community college. This Bud’s for you, Buccos! The Brewers played with themselves not once, but twice. Lastly, the Cardinals played St. Louis University and managed to squeak out a win even with the absence of Scott Spiezio (hat tip: BubbaFan). I have to say that I’ll miss that Kool-Aid facial hair a little bit this year. It looks like tomorrow brings a whole slew of Grapefruit and Cactus League action. I know more importance is placed in the games than they deserve, but it’s still awesome to be able to listen to baseball again. And during the Spring, there’s never a shortage of games to stream during the workday. Posted in Milwaukee Brewers, NL Central, Pittsburgh Pirates, Spring Training, St. Louis Cardinals. So the boys played 1 game, an intrasquad contest that pretty much equates to playing a game of sloshball with your buddies at your local elementary school yard on a weekend. Hmmm, not sure if they allow that sort of thing in this day and age, but that’s what we used to do back in college in the early 90s. Put the keg on second base and everytime you round the bag you chug one. The game usually ends when players can’t find a nearby bathroom. Scott Hatteberg and Norris Hopper both get the starting nod on opening day. Jay Bruce begins the year in Louisville. Votto makes the roster but sits against Brandon Webb. I want professional at-bats from Hatteberg vs one of the leagues toughest pitchers and I am guessing that is what Dusty will want as well. Doesn’t mean Votto isn’t a starter, mind you, but he is gonna get eased into the job. This will surely cause an anti-Dusty uproar amongst certain fans who can’t wait to see Bruce and Votto become perennial all-stars, but wait, don’t go berserk yet because in a surprise development Volquez wins a slot in the starting rotation. Affeldt becomes a situational lefty in the bullpen, the same role in which he excelled for the Rockies last season, and Fogg and Belisle fill out the rotation with anchors Harang and Arroyo. Bailey and Cueto start the year in AAA. Cueto will have a strong spring but his inexperience and lack of a full season at AAA will incline management to give him a couple starts in the minors before tossing him into the fire. Bailey will struggle with control this spring and require more time in Louisville as well. No surprises anywhere else on offense unless Alex Gonzalez’ knee issue doesn’t go away in which case Keppinger gets the starting nod at SS. If AGON winds up on the DL you will have either Castro or Janish as back up. Maybe both make the roster. They might very well carry 3 catchers again if Bako has a decent Spring. More backlash against Dusty over this issue, no matter which way he goes because this is likely a decision that takes place at the end of camp. The bullpen is what can make or break this team as we have witnessed before. Its no surprise that the last time the Reds were in serious contention they had a young hard throwing successful set up guy in Todd Coffey. Will we ever see that Todd Coffey again? I don’t know to be honest but I see him making the club along with Burton, Weathers, Cordero (obviously) and Coutlangus. Stanton gets released, and Mercker’s comeback is not convincing enough to take a chance on him. Roenick wins a job with a good spring and Majewski… I don’t know. Does he have options left? He might get traded. I guess that’s wishful thinking. Posted in Random Ramblings, Spring Training.